The tradition of afternoon tea can be placed solely upon the British, which is why its popularity still holds sway in places like Canada, the United States, India, and even Burma. Its history harkens back to the early 19th century when the Duchess of Bedford needed something to tide her over during the late afternoon. The advent of electric lighting had recently transformed such mainstays as eating so that the second of the two meals people used to eat during the day had been moved — for the aristocracy at least — until after dark so as to make use of the technologically advanced lighting. 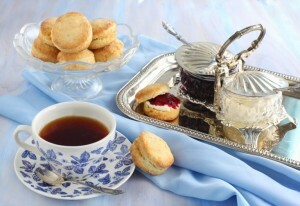 As that long expanse of time between the first meal and the second proved too much for the Duchess, she requested tea and a snack, and the tradition of afternoon tea was born. The Niagara region is home to many high-quality and varied afternoon tea experiences, and if you’ve never taken time out with a friend or family member to enjoy tea, it’s a simultaneously relaxing and invigorating experience. Just as your energy is beginning to languish after a nearly full day sightseeing, you sit down to a light and delicious snack accompanied by a refreshing beverage that often contains caffeine. As you rest, eat, and drink, your blood sugar is restored. Your rushing about is paused. You are given a chance to reconnect with a loved one or traveling companion and yourself. Afternoon tea is truly a fabulous mini meal, and if you’re planning a Niagara Falls vacation, you should reserve some space in your itinerary for these two excellent tea rooms. Located in Niagara-on-the-Lake, The Drawing Room boasts one of the most regal and traditional forms of afternoon tea available. A space of undeniable Victorian finery and charm, the tea room is laid out with meticulously set tables covered in cloth that feature fresh rose bouquets and Minton China. An excellent selection of tea is offered, and the accompanying food and condiments are superb. Warm scones, lovely finger sandwiches, Devonshire cream, and pastries are all served on shining silver stands as attentive wait staff meets your every need. You can add to the more traditional tea offerings by choosing different menu items including Canadian cheeses and wine as well. Elevenses. Taken mid-morning, this tea break is served with a simple snack. Royal Tea. Afternoon tea served with either champagne or sherry. High Tea. Also called “Meat Tea,” this tea is actually a robust meal that includes meats, cheeses, meat pies, desserts, bread, and teas. It is generally taken in the early evening. Come to Niagara, and eat and drink like the British by enjoying tea at The Drawing Room, The Savoy Room, or both.